Hello! I stayed up late last night (well, 10:00 p.m. but that's late for me since I'm usually in bed by 8:00 or 9:00 to get up at 4:00 or 5:00 a.m. for work) to work on my August Christmas Cards. I had to get them done by today to meet my deadline for the Splitcoaststampers Christmas Card Challenge. As most of you already know, I make 4 Christmas Cards a month so that I'll have about 50 Christmas Cards at the end of the year. It's tough to do, but I'm always so happy in November to have all my Christmas cards done already. For this month, I used all retired Stampin Up! sets. My first card using the Charles Dickens set 'Keep Christmas'. I used a clean and simple sketch, and tried to re-create the old world feel with the papers, coloring, and button/twine treatment. The sentiment is stamped on vellum so you can still see the image underneath. My next three cards all use images from the same Stampin Up! set called 'Big on Christmas'. My sketch is from Card Patterns (Sketch 128). These were such quick and easy Christmas cards yet full of details. The snowflake is a felt snowflake from JoAnn's Fabrics and Crafts. The poinsettias are from Prima. I used a gold gel pen on the star on the tree and the ornament on the card below. Have you started on your Christmas Cards yet? The holiday is only 4 months away! Yikes! Hello! Today I have a Paper Fashions card to show you that uses the image "Soups On!" and a sentiment from 'Kitchen Clatter Sentiments'. My sketch is by Sankari Wegman of Taylored Expressions. The paper is Cosmo Cricket "Garden Variety'. I added a paper doily behind the main image for a little added 'home-made touch'. I inked it with distress inks to age it a bit. The buttons are felt buttons purchased at JoAnn's Fabrics and Crafts. Hello! Today I have my very last McMahon Five Designs Card and Post to share with you. This fall I accepted a new Design Team position with another company, so I felt I had to step down from M5D or I'd have too much on my plate. It's been my joy and pleasure to work with them, but it's time to move on to new adventures! The card I'm sharing with you today uses an image from Solocosmo called 'Samantha'. It's a beach set that comes with the image of a little girl ('Samantha'), a sandcastle, crab, and a pail. 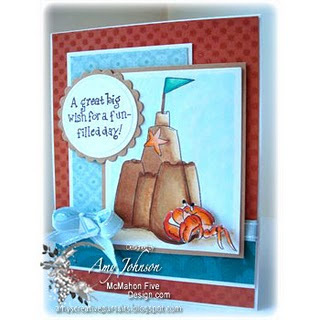 I decided to just use the image of the sandcastle and crab so that my card could be sent to a male or female. I cut the crab image out and popped him up on dimensionals. The main image panel is also popped up. The sail boat is a button from JoAnn's Fabrics and Crafts. The layout is by Mojo Monday and the paper is DCWV 'Cafe Mediterranean'. Be sure to check out the McMahon Five Designs Blog to see the rest of this week's new releases. Hello! Today I have a Paper Fashions card to show you that uses a single image called 'A Homemade Meal'. The sentiment is from "Kitchen Clatter Sentiments'. I picked up the vintage paper from JoAnn's Fabrics and Crafts. Hello and welcome to another Digital Tuesday Challenge. This week's Challenge is called 'On the Farm': Simply make a card or project that has something to do with Farms. Our sponsor this week is Whimsy Stamps and they are giving away 5 digis to one lucky randomly chosen winner. 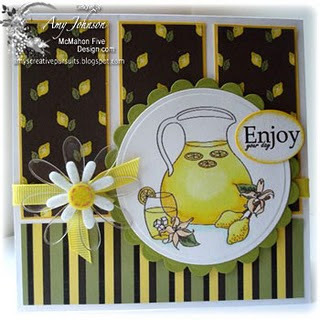 To make my card I used the Whimsy Stamps image "Piggy Bath" by Meljen's Designs. I did borrow a sketch from somewhere, but the creator of the sketch didn't write their name on it, so I don't remember where I got it from. My paper is Bo Bunny 'Crazy Love'. I printed the image twice and popped just the head up on dimensionals. The heart is a button from JoAnn's Fabrics and Crafts. I put Stickles on the hearts in the image. The sentiments are from MFT. Hello! Don't you just love that sentiment 'God Still Walks a Garden..."? Perhaps it's the gardener in me, but I can just picture God strolling through a beautiful garden. I know that's where I feel closest to Him. Anyhow, today I have a Paper Fashions card to show you that uses an image from the set "Birds and Bees" and a sentiment from the set "Planting Playful Words". My sketch is from Mojo Monday and my paper is My Mind's Eye Stella Rose 'Mabel'. I popped the main image up on dimensionals, and added buttons and ribbon for embellishment. Hello! 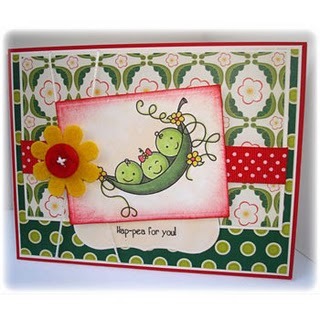 Today I have the cutest image and digital papers to show you from McMahon Five Designs. They are by Studio 313 and called 'When Life Gives You Lemons'. I absolutely love, love, love when digital images come with coordinating digital papers. It makes it so much easier for me to create a card. I don't have to 'hunt' through thousands of sheets of designer paper for that perfect match; it's already been provided for me. My sketch is by MFT (MFTWSC31). I put the main image up on dimensionals and added ribbon, an acrylic flower, and a felt flower for embellishment. Be sure to check out the McMahon Five Designs Blog to see the rest of this week's new releases. And check out my fellow Design Team Members Blogs as well; their links are in my sidebar. Hello and welcome to another Digital Tuesday Challenge. This week's challenge is hosted by ME and I picked 'Doilies' as our challenge. If you haven't already noticed, Doilies are all the rage right now in card making. Crafter's usually just put the real paper Doilies on thier cards (as I did on my card below), but now all the Paper Crafter Companies are making very intricate dies so crafter's can make their own doilies any color or design they want. So your challenge this week is to make a card or project using a doily and at least one digital element. Our sponsor this week is MyGrafico and they are giving away one digital stamp set and a 20% off in-store certicificate. To make my card, I used this adorable bunny image from Doodle Pantry called 'Bunny Wabbit'. I thought he was so sweet and would look perfect with a doily. I did get my sketch from somewhere, but don't remember where. Sorry. The paper is My Mind's Eye 'Lime Twist'. The inside of the card reads 'Somebunny is thinking of you'. Isn't that cute? Both of the sentiments came with the image. Here's a close up for you. He was such a joy to color with my Copic Markers. 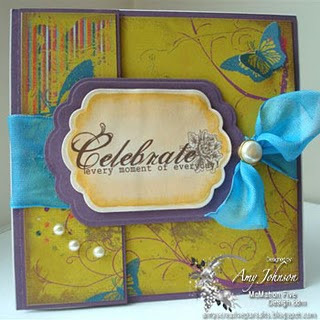 On a personal note, I just found out yesterday that I was chosen as THE FEATURED STAMPER on Splitcoaststampers! I was so excited! What an honor. However, I don't know if it's because of the busy summer season, or people don't like my cards, but so far I don't have many players. So if you have some time this week, please have pity on me and play along! LOL!